On Monday we decided to go explore a little. 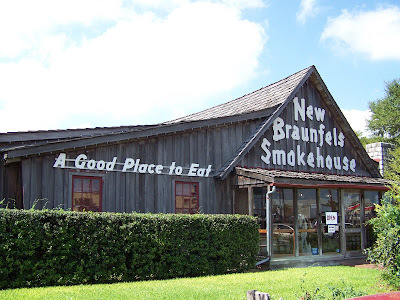 We went to New Braunfels to see what was fun to do there. With the Entertainment book in hand we found some things we could do for cheap! We had lunch at the New Braunfels Smokehouse (it's a good place to eat). The food was delicious and the atmosphere was very homey. We might even order our Thanksgiving meat from there. Then we were going to go to the Snake and Wild Exotic Animal Farm, we had a coupon. But when we got there we decided that maybe we better not waste our money. There was one car in the parking lot. The outside looked really run down and when we drove around the side to see the animals and to scope it out there were like 5 animals in the cage. So I guess you could say that we saw the Animal Farm for free. So we took the senic route back to the downtown area of New Braunfels. We went to Landra park and were going to go mini golfing...but it was closed. So we thought we'd ride the little train around the park...but it was closed. So we just got out and walked a little bit. We stopped at Dairy Queen and we on our way home. It was fun to get out of the house and see new areas of San Antonio but next time we'll try to go when there's more going on. 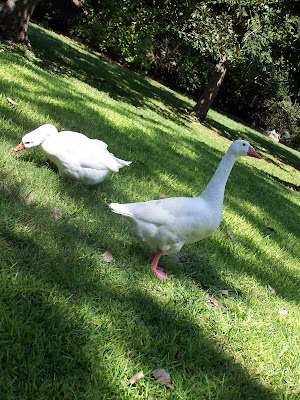 some geese at the park.